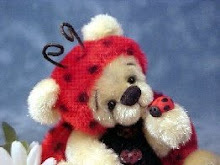 Love Bears All Things---thislittlebear.com: Thank you! A warm thank you and a big hug to all the collectors who adopted my teds in last weekend's show. 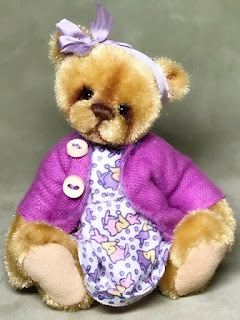 I am thrilled that not only did every bear find a new home, but I was also able to reconnect with friends and collectors that I haven't heard from in awhile. Kudos to Valerie from Bright Star for doing such a good job and for being amazing to work with and patient with me! Here are a few photos of the bears I had in the show. 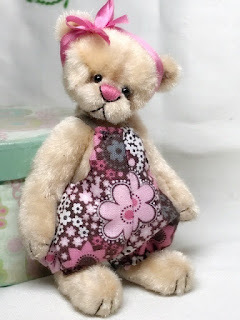 Now it's time for vacation and then back to sewing bears for the next show! Have a fantastic week!! Primrose, who has gone to live with Pat in Colorado! Piper, who is on her way to Pennsylvania to live with my dear friend Susan! Lilah... was adopted by a sweet lady named Vicki in Naperville, Illinois. 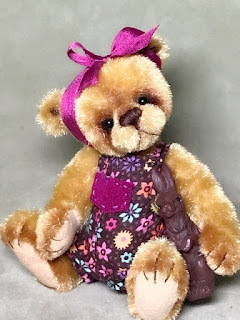 This is Kinsley and she's gone to live with Cheryl in sunny California! 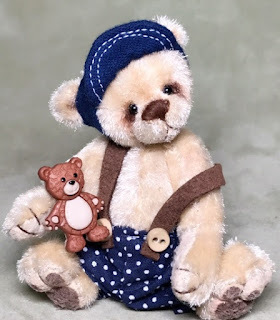 Eddie, my only boy bear this show, is on his way to Chicago to live with Diane. Molly got the best birthday present ever.... she is going to live with Patricia in Georgia! Zoey is a lucky girl because she gets to go live with the amazing Debra in sunny Florida! I'm a little bit jealous because Olivia is going to live in Lubbock with James! I'm a Texas girl myself and get a little homesick for West Texas from time to time!